All evidence suggests that China is losing its new war on Uyghur terrorism. China appears to be losing its “people’s war” against Islamist terrorism carried out by Uyghurs in the western province of Xinjiang. The campaign was launched after a spat of terrorist attacks across China starting late last year. One attack in May in Urumqi–the capital city of Xinjiang Uyghur Autonomous Region–killed 39 people injured 94 others. 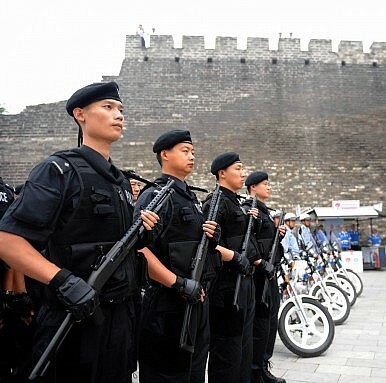 In the first month of the new terror campaign, China said it arrested 380 individuals, executed 13 others, broke up 32 “violent terrorist” gangs and confiscated 264 devices capable of detonating 3.15 tons of explosives. Then, during July– the holy month of Ramadan– Chinese authorities in Xinjiang province banned Muslim students and civil servants from participating in the holiday, including forbidding fasting. “No teacher can participate in religious activities, instill religious thoughts in students or coerce students into religious activities,” one school in the province posted on its website. This has done nothing to stop the violence in the area. While the CCP forbids foreign journalists from reporting in Xinjiang province, making information scarce, China announced on Sunday that “37 civilians were killed and another 13 injured in a terrorist attack Monday in Shache County, Kashgar Prefecture, northwest China’s Xinjiang Uygur Autonomous Region.” Chinese state media also reported, citing the police, that 35 of those killed were ethnically Han while the other two were Uyghurs. If anything, these numbers probably understate the level of violence. The reports also said that in response to these attacks, “police gunned down 59 terrorists and arrested 215 others.” Police also said that the attack was “jointly ‘organized and premeditated’ by terrorists both in and outside China,” but that the terrorists had forced civilians to participate in the attack. It also said that the attack was carried out indiscriminately, albeit this is belied by the fact that 35 of those killed were ethnically Han. None of this bodes well for China. Based on what little information the reports provided, it appears the attack on Monday was closer to a large uprising among Uyghurs rather than an attack carried out by a terrorist cell. This uprising was almost certainly the result of the repressive policies China announced for the month of Ramadan, and possibly for the mass arrests and killings as part of the new war on terrorism. Indeed, based on China’s own announcements, it appears that its terrorism campaign is widely indiscriminate. The fact that 380 people were arrested during the first month of the war on terror suggests that Chinese authorities are conducting mass arrests of individuals. This, in turn, suggests that Chinese authorities do not have good intelligence on the actual terrorists, and are having trouble getting ordinary citizens to cooperate in providing intelligence on them. The widespread crackdown is only likely to further alienate the local population, making them even more unwilling to cooperate with Chinese authorities in helping them locate the actual individuals involved in terrorism. The assassination of Imam Juma Tahir will also hinder China’s efforts to track down terrorists. If China can’t protect one of its most high profile Uyghur supporters, ordinary Uyghurs who are somewhat sympathetic to the Chinese government will be unlikely to cooperate with Beijing. This was not an isolated event; China has held a series of mass sentencings of alleged terrorists in recent months. This suggests that Chinese authorities are not only committing mass detentions as a way to obtain intelligence on the terrorists, but are willing to sentence innocent people to jail as part of a PR campaign to convince Han Chinese that the government is “tough on terrorism.” The fact that these mass sentencings are sometimes held in public stadiums attended by thousands of citizens only reinforces this image. In short, far from suppressing the violence, China’s war on terrorism appears to be inflaming it and broadening the terrorists’ base of supporters and sympathizers. By contrast, the violence committed by the Uyghurs appears to be highly targeted at Chinese authorities, Han Chinese, and Uyghurs that support Beijing. This is consistent with their goals of dissuading Han Chinese from living in Xinjiang province, as well as provoking China into an overreaction that will further alienate the Uyghur population. Crucial to understanding China’s recent moves in the region is a piece of legislation that quietly took effect on April 1.